When I met Vanesther of Bangers & Mash at Blog Summit in Bristol a couple of weeks ago, I learnt about her Recipes for Life challenge which she hosts in conjunction with SWALLOW, a charity which helps adults with learning difficulties to lead more independent lives. Do find out what it is all about by visiting her blog. As soon as I heard what the ingredients were (beetroot, carrot and cheese), I knew what I wanted to make. I first made savoury cocoa muffins for the Capricorn Challenge back in October last year and was very impressed by the results; I’m not sure why I haven’t made them since. My only concern was would I have time to do it. With a cake club meeting, a chocolate course and a birthday party to bake for, I really wasn’t sure if I could fit it in. But sense prevailed; as well as making a nice change to my lunchtime sandwich, it would save me having to make said item in the mornings before going to work, something I always find a bit of a chore. I was also given a bit of a helping hand by Ethel the Goat, who is up to her old tricks again and a round of Capricorn cheese or two found its way to my kitchen. Scrubbed 2 medium carrots and 2 smallish beetroot (weighing about 300g) then topped, tailed and grated them in a food processor. Put 300g flour (half wholemeal, half white) in a mixing bowl. Added 2 tsp baking powder, 1/2 tsp bicarb of soda and 1/4 tsp salt. Whisked together to ensure all was incorporated and there were no lumps. Stirred in 50g of chopped walnuts. In another bowl beat 2 large organic eggs with 200ml yogurt. Beat in 100ml sunflower oil. Beat in 100ml milk and a good good grinding of black pepper. Divided 100g Capricorn goats cheese into three. Chopped two lots into pieces and stirred into the batter. Chopped the third piece into twelve equal portions. Made a well in the centre of the dry ingredients and added the batter. Stirred as lightly as possible until everything was just incorporated. Added the grated beetroot and carrots and stirred just enough to incorporate into the mixture. Divided between 12 silicone muffin moulds. Topped each with a piece of goats cheese. Left for a few minutes in their moulds, then turned out onto a wire rack to cool. 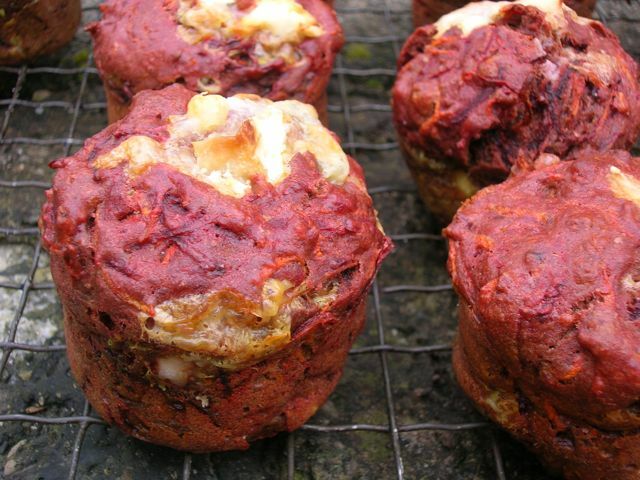 These were just as good as the Beetroot, Walnut Goat’s Cheese Muffins I originally made and the raw grated vegetables cooked through with no problem. I’m not going to write an account of the Blog Summit, a really useful gathering of bloggers from Foodies100 and Tots100 held at the famous MShed down by the river. This is partly because there was not a single piece of chocolate or chocolate cake or even a chocolate biscuit to be had anywhere – can you believe it? Partly because others have written far more informative posts than anything I am likely to do and partly because this was the only 1/4 decent picture I took. I’ve listed below a couple of particularly useful write ups that others have done. It was a useful day and despite the rather long journey, it was worth attending. I met lots of very nice bloggers and heard quite a lot of useful tips about SEO, social media and photography – the follow / no follow issue was covered at some length. Special mention must go to Ali of PLUS 2.4 and Annie of Mammasaurus who rescued me from who knows what heinous fate as I wondered around Temple Meads in daze, stupefied by the splendour of a great metropolis – I am a country lass after all! Apart from the lack of chocolate, the only slight quibble I have, is that Foodies 100 members were sadly underrepresented, with only myself and Vanesther in attendance. I love one of these with a bit of salad for lunch. What a great combo..I love the colour. I’m trying not to eat sugar for a week or so and was just on the hunt for savoury muffins to act as a snack when I decided to read through some blog posts I hadn’t got round to reading yet (I favourite them until I have time… as you can see I’m quite far behind). This was the first one I opened and I’m glad I did because these muffins were exactly what I was looking for! Thank you Manjirik. Sometimes quality will out and it’s worth paying that bit extra for it. Ooh these sound so good Choclette, I can certainly see why you made them, they look and sound absolutely gorgeous. Will definitely be popping this on my to make list. Thanks Angela. I had a spate of making loads of them to take with me to work for lunch, but I haven’t made any in far too long and really should. They are good. Muffins are just brilliant for getting in some extra veg and walnuts too. It’s time I made some again.